The Assissi atonement Hospital started in 1967 by Rev. Fr. 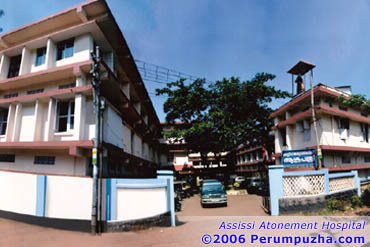 Culburt OFM Cap at Perumpuzha, Kollam district, Kerala. On 1971, his Grace, the Most Rev. Benedict Mar Gregorious, the late Arch Bishop of Trivandrum blessed the Institution. The Institution is registered under the Travancore Cochin Literacy Scientific & Charitable Societies Registration Act 1955 on 1st November 1989. Now it is run by The Congregation of Sisters of Imitation of Christ (Bethany Sisters). The Management of Assissi Atonement Hospital believes transferring the love of God by providing competent and comprehensive health care to all, who seeks its service. Sr. Amsa was the first Administrator of this institution. Rev. Fr. Mathew Karoor is the Director, who manages the institution efficiently. The day to day activities of this institution is carried out by the powerful hands of Sr. Ursula SIC, the present Administrator and very efficient and sincere Medical Superintendent Dr. B.Haridasan. At present, the hospital have 200 beds with department of General Medicine, General Surgery, Obstetrics & Gynecology, Pediatrics, Orthopedics, ENT, Ophthalmology, Dermatology and super speciality in Cardiology and Urology with fully competent staff. The Hospital provides round the clock Casuality service with the support of full time Radiological and Laboratory facilities. Also the hospital has the facilities of Ultrasound Scanning. TMT etc. The hospital is conducting daily free OPD in two centers at Veliyam and Nathirikkal, which is run by Sisters of Merciful Love Congregation Sisters. The hospital has a Scheme of free treatment for 5 poor and unsupported elderly patients. The hospital has a School of Nursing attached with the hospital. Mar Ivanios School of Nursing was started in the year 2001. (GO No. 8411/2000/NC). Here students are admitted purely on merit basis with out taking any donation from them. © Deepthi.com, 2003-2008. All Rights Reserved.